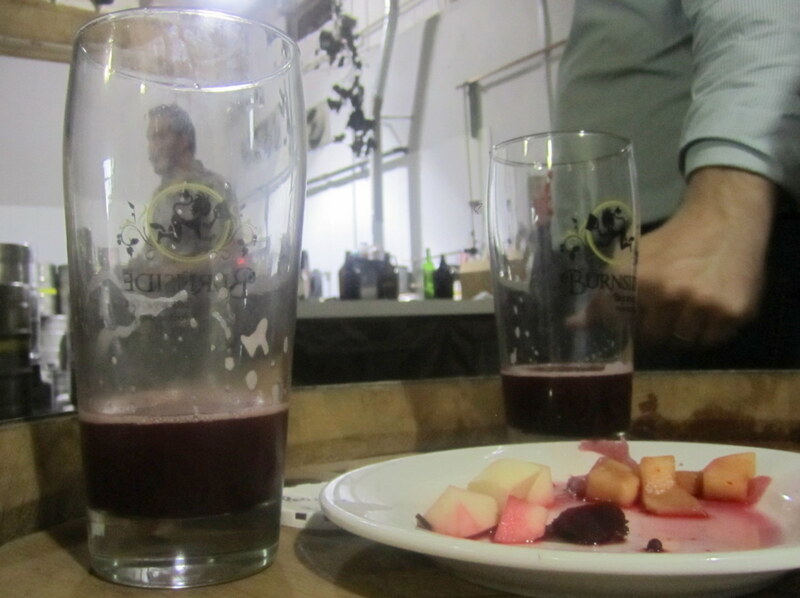 Last year's "first annual" Portland Fruit Beer Festival had about twice the attendance that organizer Ezra Johnson-Greenough expected it to have -- with most of that coming on the busy Saturday opening despite parking and traffic disruptions by the Portland Rose Festival parade a few blocks away. There were some shortages of the mostly one-off beers, but for the most part the festival went off pretty smoothly. The preponderance of beers brewed specifically for the festival made for a very enjoyable time; to jog your memory, read my recap of last year's festival. On the down side, the entry price is a little higher this year: in order to get a wristband for drinking, you must purchase a $20 package that includes a nice glass and 12 tickets for samples (the glass was only $6 last year). Additional tickets are $1. Minors and other non-drinkers get in free. Alameda Huckleberry Hound IPA: Not my favorite, but one of the quickest to run out last year, so get it fast. Bend Brewing Ching Ching Berliner Weisse: A GABF medal winner from the talented Tonya Cornett. Breakside Strawberry Rhubarb Pie Golden Ale: Made with whole pies! Burnside Red Light District Imperial Stout: A little sweet, and over 10%, but one of the few beers I've had where strawberries make a good addition. Gigantic Hot Town, Summer in the City Imperial Black Saison: Gigantic's already tasty IBS, with Ben Love's sarcastic addition of the fruit of the chile pepper plant. Laurelwood Cascara Obscura Belgian Dubbel: A delicious abbey ale, with a slight rose-hip tartness from the addition of the coffee berries -- excellent off-the-wall fruit choice. Ninkasi Cherry Bourbon Renewale Porter: Last year the Cherry Oatis was my unexpected favorite of the festival, so I have to check this one out. 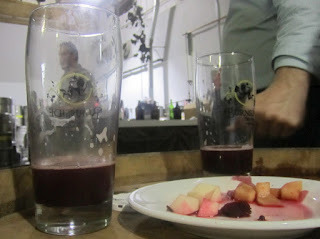 Upright Levinator Bock: The picture above doesn't do justice to the pretty beet-juice color that black currants add to this full-bodied, slightly tart bock. Delicious. Widmer Marionberry Hibiscus Gose: Last year I was underwhelmed by Widmer's very pretty Raspberry Hibiscus Gose, though lots of people loved it. I like this year's much better, it seems a little maltier and a little saltier. Check it out. I'm not even going to go into the rare beers list, but do keep an eye out for Burnside's International Incident, a news-making strong wheat ale with mangos, hot peppers, and Indian spices. There are also rare kegs from breweries seldom or never seen in Portland: Short Snout Brewing, a new Kickstarter-funded nanobrewery in town; California's Almanac (founded by a beer blogger! ); and Naked City and Schooner Exact from Washington. Car parking: good luck. The Rose Parade will further complicate matters early Saturday. Bike or take the bus. Bike parking: not much at the festival. There are big bike corrals just off East Burnside at 6th, 8th, and 9th, and there's another one at 9th and Ash. glasses were $6 last year Bill. Still its a decent deal at $8 for a gold flaked classy pint glass! @Samurai: Thanks, I was wrong about the glass price, now I fixed it. But last year there was no minimum number of tickets, so for example a couple could buy two of the nice glasses and share 10 tickets. Anyway, looking forward to a good time. yes you are correct about that. The package was created to help offset the keg prices which are seriously on the rise. The idea was to keep all the 25 main taps to 1 ticket. As is 2 beers are still way too expensive to be only 1 ticket. Likely next year we will have to re-evaluate pricing again. I thought it was an awesome deal for the amount of beer you got to try. My sister didn't even finish her 12 tickets. And I saw a bike corral inside the event, btw. I'll be back next year! @Mishelle: Yes! I was excited to see the bike corral also. I don't think many people knew about it, it was a great idea. It was a really good time again: well done Ezra, Holly, Jeremie, and everyone involved!